New York Times bestselling authors Rachel Cohn and David Levithan are back together with a life-affirming new holiday romance starring Dash and Lily of Dash & Lily’s Book of Dares! Dash and Lily have had a tough year since readers watched the couple fall in love in Dash & Lily’s Book of Dares. Lily’s beloved grandfather suffered a heart attack, and his difficult road to recovery has taken a major toll on her typically sunny disposition. Lily’s spark has dimmed so much that Langston, her brother, has put aside his grudge against Dash to team up and remind Lily what there is to love about life. 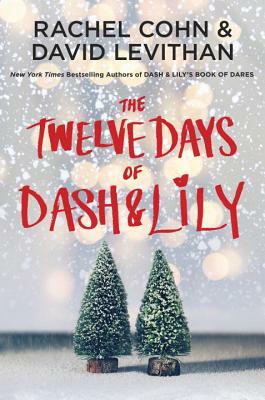 With only twelve days left until Christmas—Lily’s favorite time of the year—Dash, Langston, and their friends take Manhattan by storm to help Lily recapture the holiday spirit of New York City in December, a time and place unlike anywhere else in the world. Told in alternating chapters, The Twelve Days of Dash & Lily is bound to be a Christmas favorite for seasons to come. RACHEL COHN is the author of critically acclaimed YA novels Very LeFreak, You Know Where to Find Me, Cupcake, Shrimp, Gingerbread, and Beta. A graduate of Barnard College, she lives and writes in Los Angeles. Find her online at RachelCohn.com and @RachelCohn. DAVID LEVITHAN is a children’s book editor in New York City and the New York Times bestelling author of several books for young adults, including Boy Meets Boy; Will Grayson, Will Grayson (with John Green); Every Day; and Another Day. Follow him at DavidLevithan.com and @loversdiction. Rachel and David’s first three collaborations were Nick & Norah’s Infinite Playlist, Naomi and Ely’s No Kiss List, and Dash & Lily’s Book of Dares.